It’s been four years since Bridgestone launched their last series, the J40, and it’s been a long wait for the new series. However, the J15 are worth the wait. Though they are not considered top-tier irons in Canada, these irons happen to perform as good, if not better, than what we consider top-notch irons. Continue reading this Bridgestone J15 irons review as we’ll take a look at the 4 irons in the series in detail. The J15 series is the most extensive product line by the company consisting of better player irons, game improvement irons, and super game improvement irons. Looking for ultimate forgiveness? Try Bridgestone cast irons. Looking for forgiveness and workability? Then the cavity backs are for you, or maybe you are an elite player in search of ultimate workability; then try their muscle-backs irons. The Bridgestone J15 has something for every player. Despite Bridgestone not having a huge following for its irons, the little cult-like following it has is largely attributed to their clean, classic designs and precision engineering. Combine these with unrivaled performance (more on this later), cutting edge technologies, and amazing feel and you have yourself a set of J15 irons that other golfers will go gooey for. 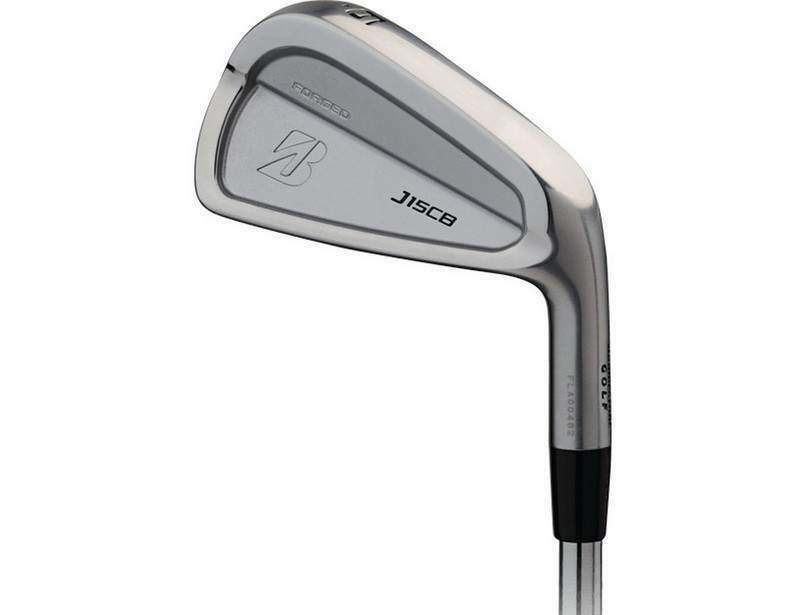 Irons in the J15 series have the aesthetics of better player irons. This is no mean feat more so on the game improver irons and the super game improvers which go to show the dedication of Bridgestone engineers to ensure you have the best golfing experience. Irons in the J15 product line were crafted for different players and thus have different features. However, the R&D team ensured that they all feature a sure contact sole for optimum turf interaction. These are out and out blades that are aimed at the elite players and I would not advise the average player to get a set. Though it would be “cool” owning a set, playing them would need another description. The J15 muscle-backs have the smallest head in the set and are quite punishing. However, they make up for their lack of forgiveness by offering unrivaled workability and versatility which is demanded by the better players. Much like any other iron in the J15 series, they feature the sure contact sole for best turf interaction. These irons are aimed at the elite amateurs who need a little forgiveness but are not willing to forego workability. The CB is short for cavity back which offers both workability and forgiveness though not to the extent that the J15 Mb would offer workability or the J15 cast irons would offer forgiveness. Surprisingly these irons look more like blades and not cavity backs (more on this in awhile). The cavity in these irons is well hidden behind the face and not easy to perceive and allows for more weight to be put on the perimeters thus enlarging the sweet spot. The result is consistent distance and accuracy on center and off-center strikes. As stated earlier, these irons look more like blades than CBs. Bridgestone engineers went that extra mile to ensure you enjoy the aesthetics; and who doesn’t love that sleek blade-like look in their irons? In the J15, Bridgestone settled for a simple clean look with the J15 CB having only one badge on the back near the heel. This simplicity brings about the “I mean business” aura in these irons. At address, the irons sit pretty well behind the ball and inspire confidence. Despite resembling blades, the slightly larger head, sole, and top line provide a little more comfort. 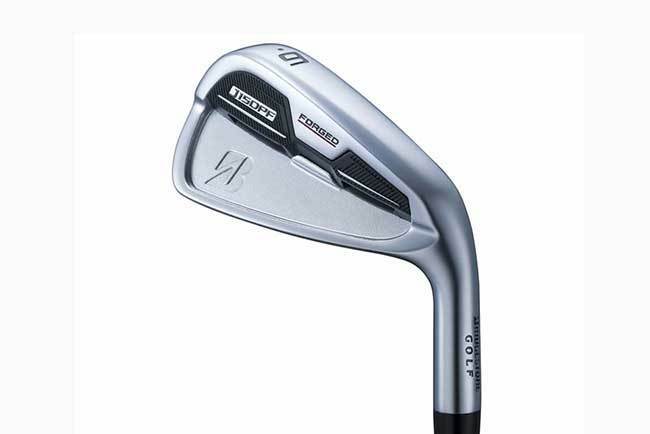 One also benefits from the premium forged 1020 carbon steel these irons are made of as it provides incredible feel. The J15 cavity back irons are simple irons which are meant to offer the ultimate combination of forgiveness and workability. And man, don’t they do that with flair. Smack the ball right on the sweet spot and it will fly straight down the intended line. Mishits, too, will not be that badly off but just a few yards from the intended spot. Compared to the MB the CB launches higher and provide more spin. Therefore if you want these two aspects in your irons, get the CBs. The J15 DF (dual forged), is the “holy grail” of irons. As a golfer, I am ever in search of an iron that provides forgiveness, is workable, have great looks, amazing feedback, and incredible sound. This is often too much to ask for and I end up with irons that meet most but not the entire criteria. However, the J15 DF have checked every box on that list. Available from loft 20® to 46® in 2.5®, 3®, 4®, and 5® intervals as you go down the set, they are some of the longer irons with players recording close to 10 yards increase in their shots. Being dual forged, they are able to hide the cavity back well behind the face giving these irons a sleek look. Being hidden cavity irons, I was expecting the DFs to be more like the chunky hybrids. They are anything but that, and intimidating is the only way to describe them. 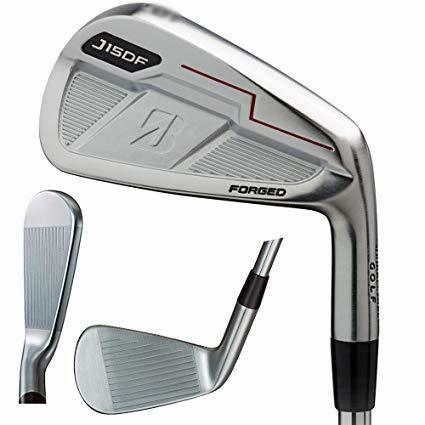 The J15 DF have the better player irons look but play like game improvers. Give these irons to any average golfer and they will put them off as too hard to play without trying them out. Thus intimidating is the only way to describe them. However, once you manage to get past the initial intimidating look, these irons sit beautifully behind the ball and are a bit comforting (just a bit). Like in all the J15s, the DF isn’t overdone with flourishes and maintains the simple look with just two stamps and a lightning-like “thingie” on the back. Talk about understated graphics. To top it off, Bridgestone has the DG Pro S300 shafts which are excellent for controlling trajectory with the bright yellow golf pride grips. They DFs are well balanced with perfect weighting which makes it easy to find the center of the face. Hits are smooth, silky, and solid with the only downside being that the head is a bit heavy during the swings. The J15 DFs deliver. If an iron ever has lived up to all expectations, it’s the Bridgestone J15 DF. These irons will ensure you get high and beautiful flights, which results in added distance thanks to their FAST (Flex Action Speed Technology) technology, with the short irons being absolute flag hunters. These irons are the definition of accuracy, with distance co﻿﻿nt﻿﻿ro﻿﻿l being second nature. You will get consistent direction on shots hit all over the face and it will be no trouble making controlled shots. The J15 DPF (dual pocket forged), are game improvers for the mid to high handicappers. Being dual pocket, they have two pocket cavities which are on either side of the central muscle back that result in extra forgiveness. These cavities combined with its premium forged carbon steel and turbo rubber design results in an exemplary iron. The only downside is that it cannot rival other irons in the series. The DPFs are power packed irons which will definitely give you more distance but are not as forgiving as was expected. 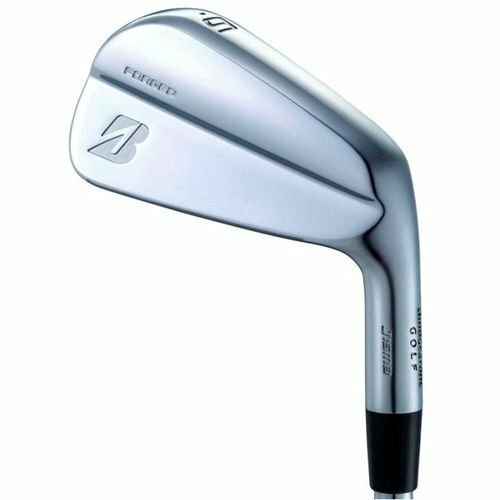 Bridgestone has exceeded all expectations in making game improver irons look like blades, and the DPF was no exception. It has a thin top line which is not found in most dual pockets, and long from heel to toe, with the size inspiring confidence. As for feedback, it’s dynamic - informative but definitely not the softest. At times the feedback was intense despite them featuring a rubber badge behind the heel and toe to soften vibration and feel (Bridgestone you should work on that). Premium forged carbon steel, turbo rubber design, dual pockets, and rubber badges are the key technologies in these irons. The premium forged steel aims to improve feel alongside the rubber badges (which they fail at). The dual pocket cavities on the back increase forgiveness and ensure stability while the turbo design (according to Bridgestone), allows the discretionary weight to be moved to the perimeter for more forgiveness and higher Moment of Inertia (MOI). They are dead on accurate, with incredible distance control and easy to control trajectory. The J15 DPF are naturally high fliers, but knockdowns are no problem. However, forgiveness was not as expected and that was a major let-down. The J15 series is an interesting product line and arguably the best by Bridgestone. Managing to produce such great irons goes to show that Bridgestone will soon be a heavyweight in the irons industry. The J15 series definitely had its pros and cons but for the better part, they did an amazing job. The DF are “fantabulous” alongside the CBs with the J15 MB being perfect for elite players. The only let-down in the series was the DPF which had intense feedback and not as forgiving. Other than that, big up Bridgestone.